Introduction to SQL:1999. User-Defined Types. Typed Tables. Routines and Routine Invocation. Foreign Servers and Foreign-Data Wrappers. Datalinks. OLAP. SQL/OLB and SQL/JRT. SQL/XML. SQL Multimedia and Application Package. A Look To The Future. Appendix: An SQL:1999 Example Using UDTs. The SQL:1999 Annexes. Relevant Standards Bodies. Status Codes. The SQL Standardization Process. 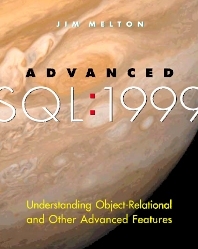 Advanced SQL:1999 - Understanding Object-Relational and Other Advanced Features is the practitioner's handbook to the standard's advanced features. It is not a re-presentation of the standard, but rather an authoritative, in-depth guide to its practical application. Like its companion, SQL:1999 - Understanding Relational Language Components, which explained the standard's basic features, this book will show you how to make your applications both effective and standard-compliant. This handy reference has a modular format so you can explore specific topics with ease. It is equally useful to those upgrading from earlier versions of SQL and those with no previous experience. Written by the standard's distinguished editor, Advanced SQL:1999 will complete your knowledge and support your skills like no other book can. Focuses entirely on the issues that matter to programmers who are connecting applications to databases. Details SQL:1999's object facilities, including structured user-defined types, typed tables, user-defined routines, and routine invocation. Examines facilities new to SQL, including those relating to on-line analytical processing (OLAP), management of external data (SQL/MED), and Java support. Covers the ongoing development of XML support. Includes appendices that cover the SQL:1999 annexes, a SQL:1999 example using UDTs, status codes, and useful information on the standardization process. Jim Melton is editor of all parts of ISO/IEC 9075 (SQL) and is a representative for database standards at Oracle Corporation. Since 1986, he has been his company's representative to ANSI INCITS Technical Committee H2 for Database and a US representative to ISO/IEC JTC1/SC32/WG3 (Database Languages). In addition, Jim has participated in the W3C's XML Query Working Group since 1998 and is currently co-Chair of that Working Group. He is also Chair of the WG's Full-Text Task Force, co-Chair of the Update Language Task Force, and co-editor of two XQuery-related specifications. He is the author of several SQL books.